With a great British cast and, from the trailer, a laugh out loud romp of a "fish out of water" type comedy. not only that it also has one of the greatest names for a film for a while. 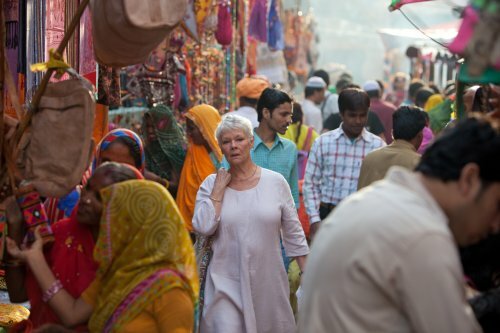 For a desparate group of English pensioners (Judi Dench, Bill Nighy, Maggie Smith, Tom Wilkinson, Penelope Wilton, Celia Imrie and Ronald Pickup), retirement takes an unconventional turn when they abandon their homeland, enticed by advertisements for THE BEST EXOTIC MARIGOLD HOTEL, a seemingly luxurious sanctuary for “the elderly and beautiful” in Jaipur, India. On arrival, they discover that the hotel falls somewhat short of the romantic idyll promised in the brochure, but they are gradually won over by the ever-optimistic young manager Sonny (Dev Patel), and tentatively embark on a new adventure, finding that life can begin again when you let go of the past.